For months, there were rumors about a possible indictment against Michael Flynn, Trump’s former national security adviser and key campaign aide. He had been under investigation by special prosecutor Robert Mueller since soon after the probe into potential collusion between the Trump campaign and Russia began in May. On Friday morning — more than six months after Mueller’s inquiry started and more than a month after the first charges were leveled in the investigation — Flynn pleaded guilty to making false statements to the FBI. That may seem like a long time for an investigation to begin yielding criminal charges, but based on the timing of the first indictments and guilty pleas, Mueller is moving fast. Our analysis of special counsel probes in the modern era, starting in 19791 shows that the fact that Mueller’s investigation has produced criminal charges at all sets it apart — a majority of the investigations over the past four decades ended without charges being filed against anyone. Moreover, in the inquiries that produced criminal charges, the first occurred more than a year, on average, after the special prosecutor was appointed — while Mueller’s investigation produced its first charges after less than five months. Historically, major special counsel investigations that have led to charges have lasted for years, with indictments trickling out as an inquiry gains momentum. Flynn has acknowledged that he is cooperating with Mueller, which suggests that more charges could be coming, as a result of the information he’s contributing to the investigation. Special prosecutors used to be a rare phenomenon, appointed in an ad hoc fashion by the president or attorney general when signs of major wrongdoing within the federal government were perceived to warrant an investigator who had no conflicts of interest related to the probe, according to Katy Harriger, a professor of politics at Wake Forest University who is the author of a book on special prosecutor investigations. Then Watergate happened, and Congress tried to create more legal protections for investigators by creating an “independent counsel” who was appointed by a three-judge panel rather than someone in the executive branch. But the part of the law that created the independent counsel’s office expired in 1999, and special prosecutors — once again appointed by the Department of Justice — have returned to being relatively rare.2 It’s anybody’s guess just how long the Mueller investigation will last, although special prosecutor investigations tend to be measured in years, not months. Some of the shorter investigations centered on one or two figures: the special counsel investigation into whether former Reagan aide Michael Deaver had lied to a grand jury about his lobbying activities; the inquiry into whether former White House political director Lyn Nofziger violated conflict-of-interest laws by lobbying for various clients (Nofziger was convicted, but the case was dismissed on appeal); and the investigation of Alexis Herman, Bill Clinton’s secretary of labor, over allegations that she took a cash bribe or solicited illegal campaign donations while she was a Clinton aide (the only indictment in the case was of a Singaporean businessman). Similarly, I. Lewis “Scooter” Libby was the only person indicted in the special counsel investigation into the disclosure of covert CIA operative Valerie Plame’s identity (he was indicted and convicted on charges of obstruction of justice, making false statements and perjury; his sentence was commuted by President George W. Bush). Other investigations took significantly longer than Mueller’s to result in charges. It took more than a year for the independent counsel investigating potential mismanagement and corruption by Samuel Pierce, Ronald Reagan’s secretary of housing and urban development, to issue charges (Pierce was never indicted, but lower-level staff were convicted). The same was true of investigations into whether Clinton’s HUD secretary, Henry Cisneros, had lied to FBI agents about payments to his former mistress and whether Clinton’s secretary of agriculture, Mike Espy, had improperly taken gifts from businesses and lobbyists (Cisneros pleaded guilty to lying to the FBI and was later pardoned by Clinton; Espy was acquitted at trial). Some investigations are especially lengthy because special prosecutors often stumble on other information when they’re pursuing a case, Harriger said. It’s unlikely that Mueller’s investigation will follow the same path as the Whitewater probe, in which Kenneth Starr’s review of Bill and Hillary Clinton’s investment in an Arkansas real estate company during Bill Clinton’s time as a state official blossomed into several unrelated investigations, including an inquiry into the death of White House aide Vince Foster and, ultimately, the scandal related to Monica Lewinsky and the president’s impeachment. But it’s too early to know for sure where Mueller will go. “It’s a slow and complex process, and it’s hard to predict where it’s going to go next,” Harriger said. 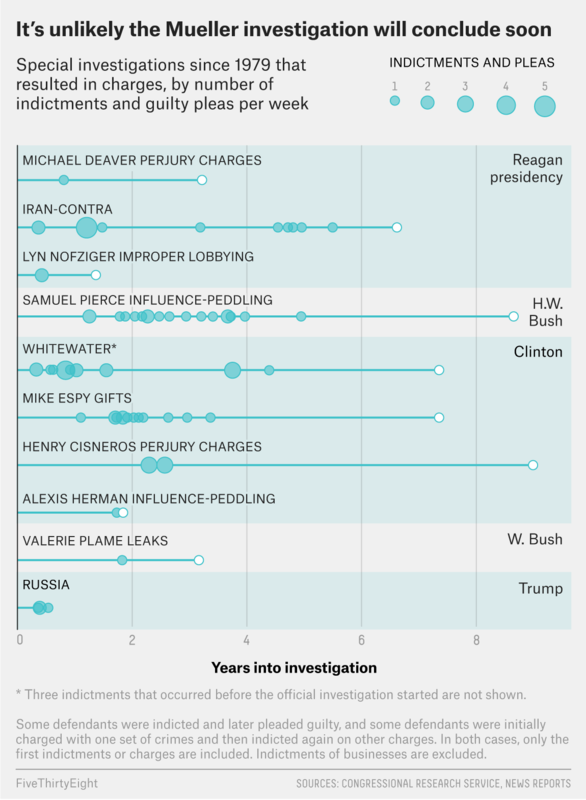 According to our analysis, there were seven special prosecutor investigations from 1875 through 1978, 21 from 1979 through 1999, and two since 1999, including Mueller’s. In which Reagan administration officials illegally sold arms to Iran at high prices and the profits were channeled into the coffers of the right-wing “contras,” who were supported by Reagan in their fight against the leftist Sandinista government in Nicaragua. The Iran-contra investigation also moved swiftly relative to other special counsel investigations in the post-Watergate era. It was also the second investigation under the special counsel law to produce charges.